Aging is bad enough. However, looking old is like the curse that comes with it. Fortunately, Dr. Gerald Imber, the renowned plastic surgeon and author, utilizing his knowledge of skin care developed a program of prevention, maintenance and correction to keep skin youthful with Youth Corridor Antioxidant Boost Skin Serum. Youth Corridor Antioxidant Boost Skin Serum penetrates deep into the inner layers of your skin to repair, stimulate, and restore cells is the result of years of his experience. This product was featured in Shape and Harper’s Bazaar Magazines as well. 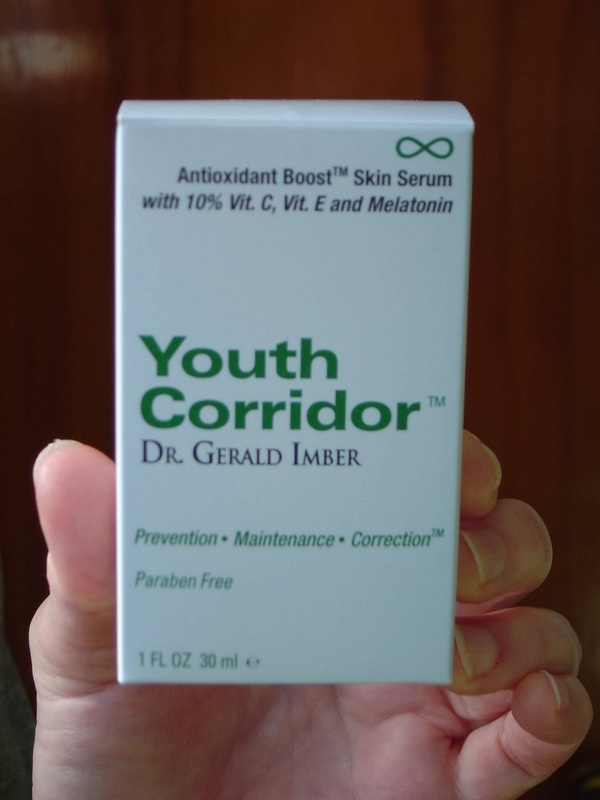 I never tried any products from Dr. Gerald Imber’s line of skin care he developed until now when I was sent a bottle of Youth Corridor Antioxidant Boost Skin Serum to review. This formulation has 10 percent of vitamin C, E, and Melatonin to help neutralize damage and protect the skin against inflammation while also assisting the skin’s natural photo-protective response from the environment. The ingredients work together to stimulate collagen and elastin production to provide a more youthful appearance. All I needed was four drops of this product on my freshly washed face at night. You can put it on your neck or chest, but I did not feel it was necessary in my case. I found keeping my face slightly damp was the best way to work the serum in. I repeated this process for almost a week. What I found was my skin looked revitalized and smoother. My complexion seemed to wake up more with healthier vibrance than before I began using this product. I thought it was wonderful how it stimulated this overall glow that my skin now had. Thanks to G. I. Skin Care, one lucky Nuts 4 Stuff reader wins a bottle of Youth Corridor Antioxidant Boost Skin Serum of their own ($125 value)!